This is the most recent of our treasures and it is full of symbols both religious and representative of our place here. The shells, for instance, are symbols of pilgrims, as well as being part of the Wesley family crest, and subsequently icons of Methodism itself. The rainbow colours are God’s promise, while the wave patterns remind us of the ebb and flow of life. The large sun and stylised cross symbol represents our belief in the Light of the World and the warmth of God’s love. The seasons are indicated by the kowhai and pohutukawa, two well-loved native blossoms, and by the autumn colours. It could be said that we do not have a real winter here! Rangitoto Island is a central landmark of our North Shore, and the seagulls show our freedom. The alpha and omega characters are caught in the rays of sunshine which are reflected in the water. 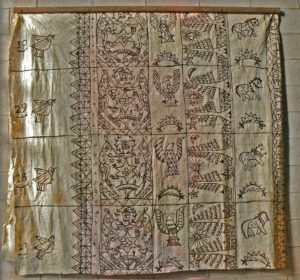 This panel is of Maori design and was worked on by a member of our own church and other Maori ladies from the North Shore. The material is raffia, coated with plastic. The white cross represents our own church while the yello stripes are the rays of the sun. The sky is shown by the blue background and the red panel at the bottom is the earth. It was given with love to our church. At the bottom of the tapa we see a crest, and this was designed by the first Christian king of Tonga to be the national emblem of that country. He had the crown drawn to show that it was indeed a kingdom, and Christian symbols are clearly seen in the crosses and the dove of peace. The stars represent the 3 islands, which the king united, and the words translate to ‘God be with Tonga, our land’. Other symbols represent the American eagle and the British lion, showing the friendships the king wished to honour. The trees are Norfolk Pines which were planted by the missionaries. 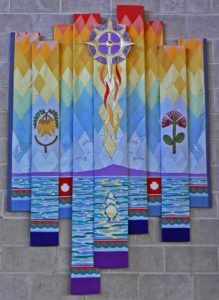 This was made by the ladies of our church in 1983 to celebrate the centenary, and it represents the first hundred years of Takapuna Methodists. Looking from the left we see the first small church which was in Taharoto Road, and on the right we see two separate buildings, representing the education block and hall, which was our church at first, then later came the church we are in today, represented by the tower. This anniversary was the time when the church and the education block were joined together by a new lounge. The scene depicts the church looking outward to the world.